In both versions of the flyby, time is speeded up 3,000 times. While both views track the comet, the first is far enough from the comet that the orbit of the Earth (green) is visible and the geometry of the encounter can be seen. In the second view, the observer is on the surface of the comet facing the position of Mars and its moons, Deimos and Phobos. When the comet is closest to Mars, the disk of Mars would half-fill the field of view in a pair of binoculars. The planet would be an awesome site! No audio. It is quiet out there. I was watching the charming movie, Helicopter Canada, made in 1966 by the National Film Board to celebrate the upcoming National Centennial. The observatory is gone now. It is where I spent many evenings during the mid-sixties. There, I learned astronomy from the wonderful members of the RASC. And that led to a 20-year career in planetariums. Topham Refractor, Montreal Centre, RASC. I used it during the 1960s. Sometime later (the story that I heard goes) someone broke into the observatory and took the objective lens) It was never replaced. The picture looks like it was taken in the late 50s. Today I am remembering the great gift of astronomy that came to all of us from John Dobson, the inventor of the Dobsonian telescope. John died yesterday at the age of 98. During my lifetime, one of the most profound developments in the technology of telescopes was made by John Dobson. In 1968 telescopes for non-professionals were either cheap and crummy, or precision optical and mechanical devices that were either very expensive, or required a sophisticated workshop to construct. Telescopes with a main lens that was more than 8 inches in diameter were almost too heavy for one person to carry, and they were beyond the means of most. Dobson changed all that. John Dobson had a passion for showing people the sky. He founded the San Francisco Sidewalk Astronomers. And to see some of the great celestial celebrites, he realized observers needed a huge telescope. His discovery, and invention, was that if all you wanted to do was have an awesome nighttime view of galaxies, nebulae, and other wonders, you could strip away most of the technology that professional astronomers must have, and make a telescope with only a big glass lens and a few sheets of plywood. The cost was mainly that lens. While I call this an advancement in technology, most of what he did was simplify the construction of a telescope, and re-think how it would be used. One of his (many) breakthrough discoveries had to do with the telescope bearings. He found that if the ‘scope moved by Teflon sliding on Formica, the coeficient of sliding friction was the same as the coeficient of starting friction. What that means is that if you have a telescope with no clock drive (to follow the stars), and had to push it by hand to keep the highly magnified target in the eyepiece, with Dobson’s bearings, the telescope would move smoothly and stop smoothly. In 1985 a group of us build a Dob with a 17-1/2 inch mirror to be able to observe the return of Comet Halley. At the time, it was the largest telescope in Manitoba (in terms of the size of the lens). 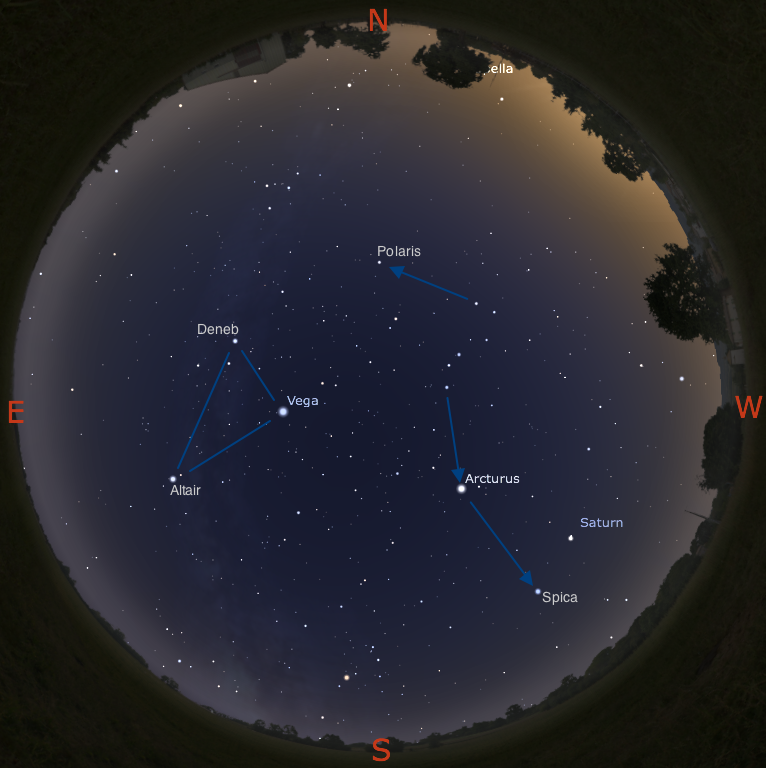 Here is the story of a group of us having our first glimpse of the Comet Halley. In the months that followed, thousands of people observed the comet with that telescope. That Dobsonian telescope is now here on Bowen Island. Having travelled to see six total solar eclipses, a partial or annular eclipse is merely interesting. Nevertheless, observing some motion in the dance of the Sun, Moon and Earth still does thrill. After an amazing stretch of clear weather, rain and cloud has moved in to blanket the Salish Sea, so we will not be able to witness today’s eclipse. Below are some great sites that are promising to live-stream the event on the Internet. 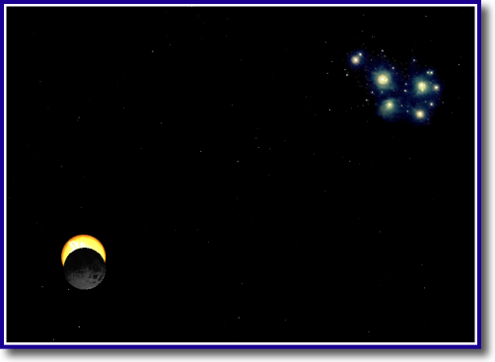 First, here is my computer simulation of the eclipse at 6 PM PDT. I was surprised to find that the Sun and Moon will be very close to the Pleiades during the event — of course those stars would not be visible even if the sky were clear. The web version of Sky and Telescope Magazine has published a list of sites where you may watch the annular solar eclipse online. 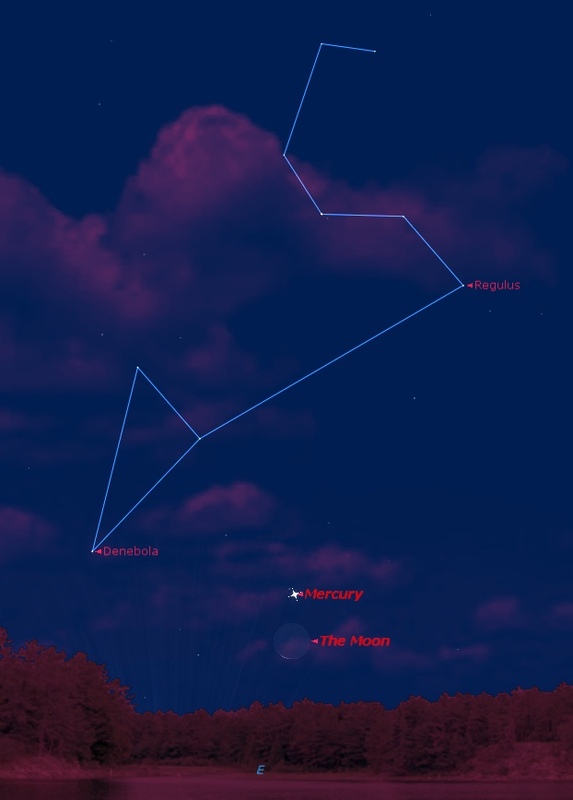 <<Click link to open Sky & Telescope page. Some of these sites may not be paying for a large bandwidth for streaming, so it if the connection you choose seems slow, try one of the others. Standard warning and fine print: if you can observe this eclipse, be advised that there is no time today when it is safe to look directly at the Sun. There are methods for safe observing, but you risk instant blindness if you don’t know them. If you are using optics, you could damage your equipment as well. Summer arrives as I am writing this post. In this part of British Columbia we can expect the summer drought to begin soon. It means lots of sunny days and clear skies at night. This is when many people look up and begin to wonder about all those stars. 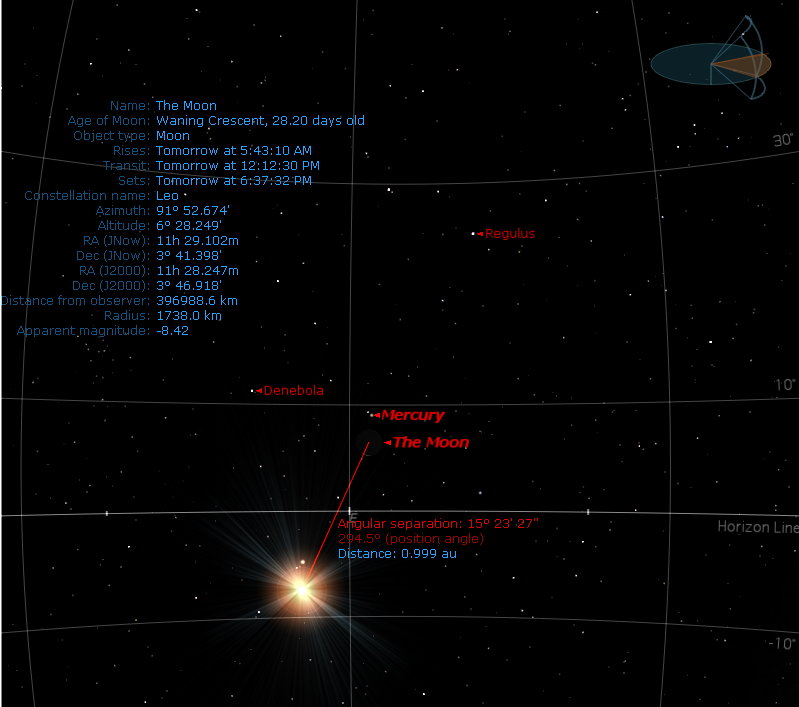 I’ve made the following maps for Canada Day, July 1, but most of these stars will be visible for weeks. Some of the most recognizable star-patterns in this part of the sky are not the constellations. High in the eastern sky, three bright stars from three separate constellations make up the Summer Triangle: Vega, Deneb, and Altair. The Big Dipper is not a constellation (it is part of the Big Bear), but it is so well known that it is the major guide to most of the bright stars in this region. The two stars at the end of the bowl are sometimes called the Pointer Stars because a line between them extended across the sky leads to Polaris. It is useful to know about Polaris: if you look towards Polaris you are facing within 1-degree of true North. In the other direction, follow the arc of the handle of the Dipper down to Arcturus and spike on down to Spica. 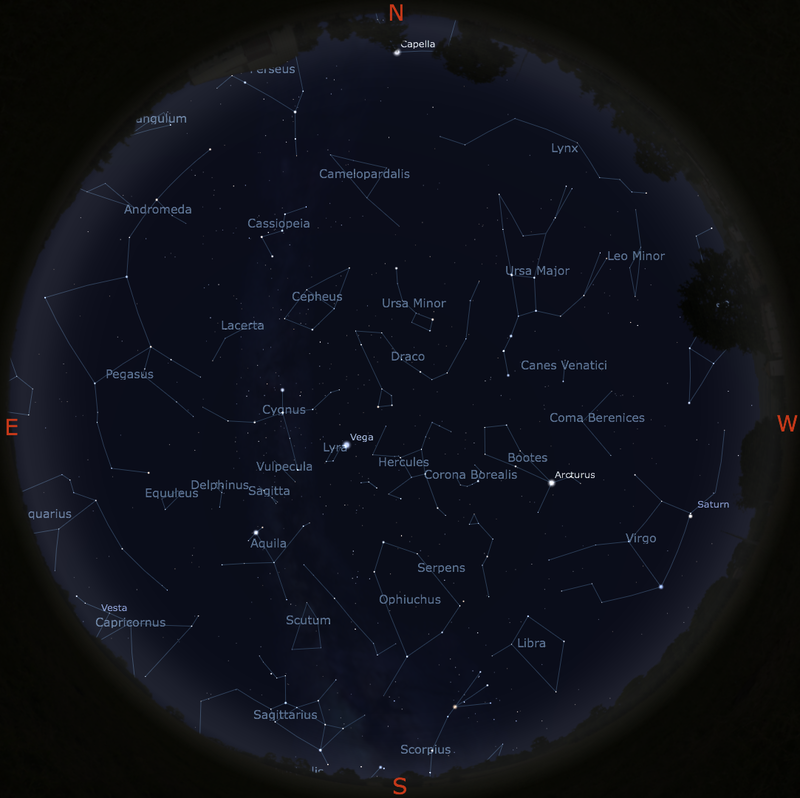 Here is a detailed constellation map for later in the evening when the sky is darker. These maps are thumbs… click to see full size. You are welcome to print them for your personal use (not for publication).